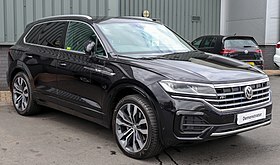 The Volkswagen Touareg (German pronunciation: [ˈtuːaʁɛk]) is an executive luxury SUV produced by German automaker Volkswagen since 2002 at the Volkswagen Bratislava Plant. The vehicle was named after the nomadic Tuareg people, inhabitants of the Saharan interior in North Africa. 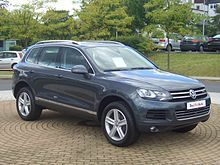 The Touareg (internally designated Typ 7L) was a joint venture project developed by Volkswagen Group, Audi and Porsche. The goal was to create an off-road vehicle that could handle like a sports car. The team, with over 300 people, was led by Klaus-Gerhard Wolpert and based in Weissach, Germany. The result of the joint project is the Volkswagen Group PL71 platform, shared by the Touareg, the Audi Q7 and the Porsche Cayenne, although there are styling, equipment, and technical differences between those vehicles. The Touareg and Porsche both seat five, while the Q7's stretched wheelbase accommodates a third row for seven passengers. The Volkswagen Touareg is built at the Volkswagen Bratislava Plant in Bratislava, Slovakia, alongside the Audi Q7 and Porsche Cayenne. Due to the demand, and the exchange rates of euros against the US dollar, as well as different pricing and environmental policies in the US, the V6 and V8 engine variants make up most of Volkswagen's American Touareg offering. Compared to other Volkswagen-branded vehicles sold in the US which are aimed at the mass market, Touaregs came in the more upscale trims and placed in competition with other luxury crossover SUVs from BMW and Mercedes-Benz. However, a limited number of the V10 TDI Turbocharged Direct Injection (TDI) diesel engines was available in the 2004 model year (before being pulled for environmental reasons). They were brought back to the United States for the 2006 as a "Tier I emissions concept (43 state emissions)". The Touareg comes as standard with a four-wheel drive system. It has an automatic progressively locking centre differential (with manual override), and a "low range" setting that can be activated with in-cabin controls. Options to make the vehicles more capable off-road include an available 4-wheel Adaptive Air Suspension (plus Continuous Damping Control) which can raise the car's ride height on command, and an interior switch allowing the rear differential to be manually locked. A very rare but available option was also a front locking differential. Its load level ground clearance is at 6.3 in (160 mm), Off Road Level is at 9.6 in (244 mm), and Xtra clearance of 11.8 in (300 mm). A 2007 Volkswagen Touareg 2 V10 TDI towed a Boeing 747 airliner in 2006. The 6.0-litre double overhead camshaft (DOHC), 48-valve W12 engined version was initially intended to be a limited-edition model, with just 500 units planned to be produced; around 330 were slated for sale in Saudi Arabia, with the remainder sold in Europe. Some of those W12 Touaregs were sold in China, but the number of sold is unknown. No sales in the United States were made. Eventually, the W12 model became an ordinary model without any production restrictions. It is estimated to reach 100 kilometres per hour (62.1 mph) in 5.9 seconds. The V10 TDI returned to the U.S. market as 2006 model year vehicle in five states. Later US models went on sale in 2006, which was compliant with 50 states emission with Ultra-low sulfur diesel and particulate filter. Stricter California Air Resources Board (CARB) emissions standards resulted in the V10 TDI being cancelled again in the United States. The V10 engine has since been replaced by a V6 TDI engine that meets the CARB minimum emission requirements for the 2009 model year. However, in 2015 it was discovered that these V6 engines were not meeting the CARB emissions requirements and were part of the Volkswagen emissions scandal. Fifth Gear used this version for testing to tow a Boeing 747. In the US and Canada, the facelifted Touareg was marketed as the Touareg 2 for the 2008–2010 model year, reverting to simply Touareg in 2011. The "R50" naming comes from the engine displacement: 5.0 L. The R50 was offered with a 5.0-litre V10 diesel engine that produces 257 kW (349 PS; 345 bhp) and 850 N⋅m (627 lbf⋅ft) of torque, pushing the car from 0 to 100 km/h (62.1 mph) in 6.7 seconds. The R50 came standard with 21-inch Omanyt wheels, sport-tuned air suspension, decorative 'engine spin' finish interior trim inlays, and an optional four-zone Climatronic climate control system. It is a version of the V6 TDI with improved performance. The 2007 version of the V6 TDI has 239 PS (176 kW; 236 hp) and 500 N/m of torque. With this engine, the car can reach 100 km/h (62 mph) from a standstill in 8.3 seconds. The V6 TDI Clean Diesel is a version of the V6 TDI with Selective Catalytic Reduction (SCR) system, replacing the V10 TDI in US and Canada. The Touareg contains a 4.5 US gallons (17 l; 3.7 imp gal) tank in the rear of the vehicle underneath the spare tyre which stores the AdBlue solution. It is estimated that this tank will need to be replenished every 6,000–10,000 miles (9,700–16,100 km). The Touareg does not include NOX storage catalyst found in Jetta Clean Diesel TDI due to its heavy weight. Touareg BlueTDI was unveiled at the 2007 Geneva Motor Show. The production version of the V6 TDI Clean Diesel was unveiled at the 2008 LA Auto Show. Although sales of the production version were planned in North America for 2008, it did not start until 2009. The Touareg "Lux Limited" is a version of the V6 TDI Clean Diesel (225PS), V6 FSI, V8 FSI for the US market. It features 20-inch alloy wheels ("Mountain" type) with size 275 all-season tires and a choice of 4 body colours (Biscay Blue, Black Magic Pearl, Campanella White and Galapagos Gray). It also came equipped with full body color aerodynamics body kit, dual power front seats, full Cricket two tone leather interior, touch screen navigation with streaming bluetooth audio, 320 watt 11-speaker audio system and adaptive high intensity discharge headlamps. The Touareg V6 TSI Hybrid is a prototype hybrid vehicle featuring a 2,995 cc (182.8 cu in) V6 petrol engine with a 'Twin Vortices Series' (TVS) supercharger rated at 333 PS (245 kW; 328 bhp) at 5,500 rpm and 440 N⋅m (320 lbf⋅ft) of torque at 3,000 rpm, an electric motor rated at 52 PS (38 kW; 51 bhp) and 300 N⋅m (220 lbf⋅ft) of torque and an eight-speed automatic transmission. It has combined ratings of 374 PS (275 kW; 369 bhp) and 550 N⋅m (410 lbf⋅ft) of torque. The electric-motor is powered by 240-cell, 288 V, 6 Ah nickel metal-hydride battery array. The 4motion four-wheel drive system was replaced by a lighter Torsen centre differential from Audi Q7 to save weight. The electric motor has the top speed of 50 km/h (31 mph). Start-stop system supports regenerative braking, coasting. Power steering, air conditioning were changed to be powered by battery. US models include 3.6 V6, 4.2 V8, BlueMotion 3.0 V6 TDI. Canada models include 3.6 V6, BlueMotion 3.0 V6 TDI. BlueMotion 3.0 V6 TDI was sold as V6 TDI Clean Diesel in US and Canada. In Canada and the US, ads showed the Touareg being capable of feats that other Volkswagen cars could not accomplish, such as going right through a snowbank while a New Beetle got stuck. In 2007 día de los Innocentes, Volkswagen Spain site showed a fake Touareg Cabrio convertible. The site was registered to VW's Spanish division. The second generation (Typ 7P) was revealed on February 10, 2010 in Munich, and later at the 2010 Beijing International Auto Show. The vehicle was unveiled at the 2010 Geneva Motor Show, and later at the 2010 New York International Auto Show and 2010 Guangzhou Auto Show. The Chinese model went on sale in early 2011. The Touareg Exclusive is a version of the Touareg that features seats with a two-tone leather combination "Nappa" upholstery in 2 colour combinations (Pepper Beige–Titan Black, Dark Burgundy–Titan Black), heated front seats with electric 12-way settings, electro-pneumatically adjustable backrest side bolsters and head restraints with longitudinal and height adjustment; leather door inserts, a black headliner and sill panel strips in stainless steel with exclusive lettering, decorative elements made from real wood in "Olive Silk Gloss", 19-inch "Salamanca" alloy wheels in Sterling Silver (no-cost optional 19-inch Girona wheel, optional 20-inch "Tarragona" wheel), Chrome & Style package and roof rails in anodised silver. The Race Touareg 3 is a race car built for the 2011 Dakar Rally, replacing the Race Touareg 2. It includes a 2.5-litre twin-turbocharged TDI engine rated at 300 PS (221 kW; 296 hp), a 5-speed sequential gearbox with a ZF-Sachs three-plate ceramic clutch, a steel spaceframe chassis and BF Goodrich 235/85 R16 tyres. The Race Touareg 3 Qatar is a concept car based on the Race Touareg 3, but adapted for street use. It includes BBS 18-inch gold wheels, Serpentino Grey Metallic safety cage, Recaro racing bucket seats, Matt Carbon interior trim, "Black" and "Pure Grey" Nubuk leather upholstery at seat side supports and the door trim panels, Titan Black Nappa leather-upholstered centre seat panels, two-tone seams and silver piping on the seat covers and safety-related items painted in Tornado Red. The Touareg Gold Edition is based on the Touareg with a 4.2 V8 FSI engine. It includes custom designed 22-inch wheels, roof rails, protective guard strips and window frames, mirror caps and parts of the air intake frame, "Magic Morning" body colour, 24-carat gold accents and switches, "Luna" interior trim colour, Luna Alcantara roofliner and Nappa leather seats, natural brown leather dashboard with Magnolia seams and floor mats in Natural brown with leather inserts in "Luna". The Touareg X is a limited (1000 units) version of the 2014 Touareg TDI Clean Diesel Lux (240PS) with 4MOTION all-wheel-drive system for the US market, commemorating the 10th anniversary of the Volkswagen Touareg. It includes unique 19-inch 'Moab' aluminum-alloy wheels, Moonlight Blue Pearl body colour, LED taillights, Touareg X-specific badging, Vienna leather seating surfaces in Black Anthracite, a complementing black headliner, a panoramic powered sunroof, keyless access with push-button start, bi-xenon headlights with LED Daytime Running Lights, front fog- and cornering lights, RNS 850 navigation system with an eight-inch color touchscreen, 60GB hard drive, and rearview camera; Bluetooth technology, Climatronic dual-zone air conditioning, 12-way powered and heated front seats with driver seat memory and power adjustable lumbar and a leather-wrapped multifunction steering wheel. electric motor 46 PS (34 kW; 45 hp)at1500–3250 ? combined 380 PS (279 kW; 375 hp)at? 580 N⋅m (428 lb⋅ft)at? V6 TDI BlueMotion Technology (245 PS) ? 2,967 cc (181.1 cu in) V6 turbo 245 PS (180 kW; 242 hp) at3800–4400 550 N⋅m (406 lb⋅ft) at1750–2750 7.6 220 km/h (137 mph) Germany, Australia and South Africa. V8 TDI 2010–2018 4,134 cc (252.3 cu in) V8 turbo 340 PS (250 kW; 335 hp) at 4,400 800 N⋅m (590 lb⋅ft) at1750–2750 5.8 242 km/h (150 mph) Eastern Europe (2010-2014), Ukraine, Australia, New Zealand, South Africa and Chile. As part of the Touareg product launch in China, a 3-part, 15-minute total movie named A Journey Beyond (锐·享征程) was produced. The movie was produced by DDB Guoan, and directed by Lu Chuan. The film itself was nominated as finalist in China Longxi awards under the FILM – Craft: Best editing category. As part of National Museum of China sponsorship, Touareg Hybrid vehicles were offered as free shuttle service – named "Museum Hopping" – between the National Museum, the Palace Museum and the National Art Museum. Availability of online services: point-of-Interest search via Google, maps provided by Google Earth, a Google Street View function and traffic reporting. The third generation Touareg will use the Volkswagen Group MLB platform like its corporate siblings, the Porsche Cayenne and Audi Q7. The third generation Touareg will emphasize fuel efficiency and will reportedly be significantly lighter than the first two generations. VW has discontinued the Touareg for sale in the US after the 2017 model year onward, based on sales, and on the availability of the larger and less expensive Atlas model which was specifically designed for the US market. It includes a 5.5 L V12 clean diesel engine with dual Garrett TR30R turbochargers rated at 550 PS (405 kW; 542 bhp) and 850 N⋅m (627 lbf⋅ft) of torque, Xtrac six-speed sequential transmission, 9-inch rear axle, Fox Racing Shocks, KMC 17" custom forged beadlock wheels with BFGoodrich Baja KRT 37x13.5x17 tires, Lowrance 9200 GPS and Sparco carbon fiber racing seats. It uses a mid-engine, rear wheel drive layout. The chassis and body were designed by Arciero Miller Racing and Volkswagen Design Center California respectively. The vehicle was unveiled at the 2008 LA Auto Show. In the 2006 Dakar Rally, Volkswagen driver Giniel de Villiers and co-driver Tina Thörner claimed second spot the highest ever for a diesel model in the new Race Touareg 2. It has a shorter wheelbase than the original Race Touareg, as well as increased visibility. For the 2007 Dakar Rally, VW driver Mark Miller and Ralph Pitchford drove the Race Touareg 2 to 4th position overall. In the 2008 Central Europe Rally, Carlos Sainz drove his Race Touareg 2 to victory. Finally, in the 2009 edition of Rally Dakar, Volkswagen achieved a one-two result. Giniel de Villiers and co driver Dirk von Zitzewitz won the race ahead of Mark Miller and Ralph Pitchford. With just two days to go, Carlos Sainz crashed out after dominating the rally for several days, thus preventing Volkswagen from making it a one-two-three result. A 1/32 slot car model of the Red Bull-sponsored Touareg, which is designed to run on the company's RAID track (which simulates off-road racing), is available from Ninco. On September 20, 2015 a Touareg V6 TDI driven by Rainer Zietlow, Marius Biela and Sam Roach completed the run of 19,000 km from Cape Agulhas, the southernmost point of Africa, to the North Cape (Nordkapp) of Norway in a world record time of 9 days, 4 hours, 9 minutes and 27 seconds. For the record run, a stronger suspension was added, larger tires, a roll-cage and extra strong Hella head lights as well as additional tanks for a total range of 3,000 km (1,900 mi). The 244 hp (182 kW) V6 TDI engine as well as other mechanical parts such as gearbox and drive shafts were standard. ^ a b "Touareg – Complete Specs (USA)". VW.com. Archived from the original on 2012-03-03. Retrieved 2012-03-06. ^ "Touareg V10 TDI tows a 747". ^ "Auto Tech: Pumpe Duse". CanadianDriver Communications Inc. CanadianDriver.com. 29 September 2004. Retrieved 4 November 2009. ^ Abuelsamid, Sam (2006-10-19). "2006 VW Touareg diesel now on sale with a particulate filter". Green.autoblog.com. Retrieved 2010-10-09. ^ Abuelsamid, Sam (2008-10-27). "In the Autoblog Garage: 2008 Volkswagen Touareg V10 TDI". Autoblog.com. Retrieved 2009-07-14. ^ Stuart Waterman. "Paris Motor Show: Volkswagen Touareg world premiere". Autoblog. Retrieved 14 July 2015. ^ John Neff. "New York Auto Show: Volkswagen unveils the Touareg 2". Autoblog. Retrieved 14 July 2015. ^ Simona (28 September 2006). "2007 Volkswagen Touareg". Top Speed. Retrieved 14 July 2015. ^ "VW Releases Details On 350Hp Touareg R50 – Carscoop". Carscoop.blogspot.com. Archived from the original on 2011-10-01. Retrieved 2009-04-30. ^ Navarro, Xavier (2007-11-21). "Volkswagen improves the Touareg TDI". Green.autoblog.com. Retrieved 2010-10-09. ^ Blanco, Sebastian (2007-03-06). "More pictures and details of VW's Touareg BlueTDI in Geneva". Green.autoblog.com. Retrieved 2010-10-09. ^ Abuelsamid, Sam (2008-11-20). "LA 2008: Volkswagen Touareg V6 TDI, 25 mpg highway". Green.autoblog.com. Retrieved 2010-10-09. ^ Jonathon Ramsey. "Detroit 2009: Volkswagen Touareg Lux Limited sports J. Crew colors". Autoblog. Retrieved 14 July 2015. ^ Abuelsamid, Sam (2009-02-02). "Volkswagen to launch Touareg BlueMotion hybrid in 2010". Autobloggreen.com. Retrieved 2010-10-09. ^ Neff, John (2006-11-22). "Touareg V10 TDI tows a 747 — Autoblog". Autoblog.com. Retrieved 2011-01-17. ^ Alex Nunez. "Practical Joke of the Day: VW Touareg Cabrio". Autoblog. Retrieved 14 July 2015. ^ Siddharth Raja. "Time waster of the day: Bourne Stunt Simulator". Autoblog. Retrieved 14 July 2015. ^ "2012 Volkswagen Touareg SUV Trims & Specifications | Volkswagen". Vw.com. Retrieved 2011-09-20. ^ a b "New Touareg takes the SUV idea into the future". Archived from the original on 2012-03-03. Retrieved 17 February 2010. ^ "2011 Volkswagen Touareg". Retrieved 17 February 2010. ^ "To the Point: The New Touareg. Volkswagen SUV is one of the safest automobiles of all times". Archived from the original on July 20, 2011. Retrieved 2 June 2010. ^ "2011 Volkswagen Touareg Hybrid First Drive". Retrieved 18 May 2010. ^ Jonathon Ramsey. "Geneva 2010: 2011 Volkswagen Touareg sports more features and curves, less weight". Autoblog. Retrieved 14 July 2015. ^ Frank Filipponio. "New York 2010: Second generation Volkswagen Touareg makes U.S. debut, Hybrid too". Autoblog. Retrieved 14 July 2015. ^ Volkswagen Group. "Volkswagen Group Volkswagen Brand Interprets "Think Blue." at Guangzhou Auto Show". Archived from the original on 14 July 2015. Retrieved 14 July 2015. ^ Noah Joseph. "Volkswagen releases luxurious new Touareg Exclusive for German market". Autoblog. Retrieved 14 July 2015. ^ Steven J. Ewing. "Volkswagen unveils Race Touareg 3 for 2011 Dakar Rally duty". Autoblog. Retrieved 14 July 2015. ^ Noah Joseph. "Volkswagen hits Qatar with a pair of special Touaregs". Autoblog. Retrieved 14 July 2015. ^ "Volkswagen pays tribute to the Touareg with the Touareg X Special Edition". Retrieved 14 July 2015. ^ a b "Entdecken Sie den Touareg in 8 Ausstattungsvarianten. < Touareg < Modelle < Volkswagen Deutschland". Volkswagen.de. Retrieved 2011-09-20. ^ Volkswagen Group. "Volkswagen Group The second BlueMotion generation puts highly innovative efficiency technology on the road". Archived from the original on 21 January 2015. Retrieved 14 July 2015. ^ "Trekking with the Kazakhs for the Volkswagen Touareg". DDBLOG. ^ "DDB Guoan and Lu Chuan Develop Innovative Campaign for Volkswagen Touareg Launch". DDB China Group. ^ "Pictures: 2011 Volkswagen Touareg sales in China exceeded 22 000". Hot News. Archived from the original on 2013-04-21. ^ "Campaign, January 2011, THE WORK 1 PRIVATE VIEW CREATIVE" (PDF). Campaign. ^ "DDB China Group leads at multiple award shows: harvesting 51 awards in 2 months in 18th China international ad festival 2011, Longxi award 2011 and China Effies". DDB China Group. 2011-10-25. ^ "Volkswagen to become "Friend of National Museum of China"". Volkswagen. Archived from the original on 2016-02-22. Retrieved 2012-08-08. ^ "2011-2015 Volkswagen Touareg IIHS Rating". Insurance Institute for Highway Safety. 2015. ^ "Official VW Touareg safety rating". Retrieved 27 February 2019. ^ Abuelsamid, Sam (2007-07-26). "VW Touareg TDI wins Pikes Peak high performance showroom stock". Green.autoblog.com. Retrieved 2010-10-09. ^ Abuelsamid, Sam (2007-05-06). "VW Race Touareg wins Baja 500 class on single tank of diesel". Green.autoblog.com. Retrieved 2010-10-09. ^ Blanco, Sebastian (2008-11-13). "LA Preview: Volkswagen unveiling Touareg TDI Trophy Truck". Green.autoblog.com. Retrieved 2010-10-09. ^ Korzeniewski, Jeremy (2008-11-24). "VW Touareg TDI Trophy Truck finishes Baja in 13th place". Green.autoblog.com. Retrieved 2010-10-09. ^ a b "2004 Volkswagen Race-Touareg T2 – Images, Specifications and Information". Ultimatecarpage.com. 2004-01-18. Retrieved 2010-10-09. ^ a b "2006 Volkswagen Race Touareg 2 – Images, Specifications and Information". Ultimatecarpage.com. 2005-12-05. Retrieved 2010-10-09. ^ "News channel". Motorsport.com. 2008-04-26. Archived from the original on 2011-06-06. Retrieved 2010-10-09. ^ "Volkswagen final report". Motorsport.com. 2009-01-18. Archived from the original on 2011-06-06. Retrieved 2010-10-09. ^ "Cape2Cape". Retrieved 1 October 2015. 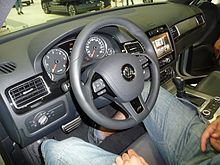 Wikimedia Commons has media related to Volkswagen Touareg.